For over a week now, I've been on this detour from working on my book where I've tried to figure out where kayaks came from. The origin of the kayak was supposed to be just a page or two in my book in a chapter on the history and evolution of the baidarka. Unfortunately, I have found out that there isn't much to be found on the topic. At least not where I've looked. I imagine if I trucked on down to the university library whereever they hide the archaeology journals, I could probably find something, but would this be worth the effort? I'm starting to get pessimistic about the prospect. Nevertheless, let me throw out what I've found. None of this is coherent, it is more in the nature of dots that can't be connected, or maybe dots that can be connected in any way you like provided you have an active enough imagination. So here goes – random facts about kayaks and their possible origin. The use of kayaks more or less died out after WWII due primarily to a glut of cheap energy. People throughout the Arctic could afford to buy aluminum skiffs and put outboard motors on them. That plus high-powered rifles made it possible for two people, one of them steering and the other one shooting to run down just about any kind of game and bag it. In the historical period, that is, from the time that European whalers moved into the arctic, kayaks were found in Greenland, across the Canadian North, Alaska and the part of Siberia closest to the Bering strait. Kayaks did not spread any farther west across Siberia than the Bering Sea Coast. I don't know much about Siberia, but it seems that a kayak along the Arctic Coast would have been a handy thing. Why then didn't these people have any? My guess is reindeer herding. There might be other factors, but it seems that the people of most of Siberia did not depend primarily on the sea for sustenance but lived off the reindeer herds which they followed and tended. The kayak could have been invented in one place and then spread out across its current range from there. Or the kayak could have been invented in more than one place. The kayak could have been invented by the ancestors of the Eskimo-Aleuts and brought with them into what is now Alaska. Or the kayak could have been invented after people had already migrated into Alaska. Open boats are generally more handy than closed deck kayaks for just about everything other than solitary hunting. My guess is that kayaks were used primarily in places where survival depended heavily on sea mammals as food and as a source of skins. 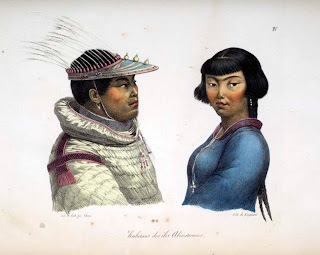 People who first migrated to Alaska were of two types, people of the interior and people of the coast. These two types of people had different hunting technologies. The people of the coast traveled by water and also got their food primarily from the water. It was the people of the coast that invented the kayak. We don't know much about the people of the coast before 10,000 BP (before the present) because the coast that they lived on is under 300 feet of water. 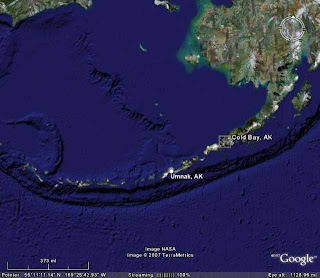 The earliest evidence for the use of boats in Alaska is 8500 BP at Anangula. The evidence is indirect. Anangula is an island and could only have been reached by boat. By 6000 BP people had moved to Adak in the middle of the Aleutian chain. The people who migrated down the Aleutian chain may already have had kayaks. They had to have boats to make the migration. Most likely those were larger open boats. However, I don't know whether the open boats would have been suitable for hunting. It is possible that the ecology of those days was different and that there was enough food available for people that didn't have kayaks or that they had different hunting techniques in those days. But to venture out on the ocean in an open boat requires a pretty large open boat, one that requires a sizeable crew. At least in historical times, t he open boats were only used for whale hunting. 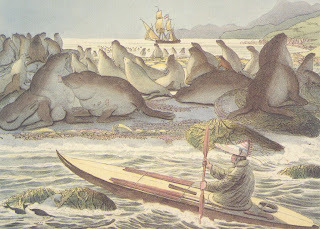 But the Aleuts, at least in historical times, did not hunt whales from open boats. There is a good deal of similarity between the baidarka of the Aleuts and the baidarka of their neighbors down the coast in Kodiak. There is also a fair amount of similarity between the baidarka of the Aleuts and the kayaks of the Bering Sea shore up to Bering Strait. Perhaps they all had a common ancestor or perhaps key design features spread throughout the whole region over a period of centuries. Apparently as early as 2000 BP, kayaks at Seward Peninsula already used the four stringer, round hulled design that is still in use today. This is based on a piece of kayak skin found on the Seward Peninsula by Danish Archaeologist, Helge Larsen. The region of kayak cultures has in the past been occupied by a number of different cultures. Each culture had different technologies for manufacturing hunting weapons and other tools. As a matter of fact, it is primarily stone artifacts that survive over long periods of time and it is these artifacts that define cultures. Not much else remains to tell us who lived where and when. The existence of kayak is deduced from the type of hunting implements found. At least during the historic period, certain types of weapons were associated only with kayaks. The presence of these weapons could suggest the existence of kayaks. Kayak parts themselves are hard to find. The only thing that would survive would be deck toggles to hold weapons and such. However, kayaks were not stored indoors and it is at house sites that archaeologists typically dig. Archaeology in the Arctic is paced by the number of people willing to work at it. There is still quite a bit of territory that hasn't been explored. Archaeologists had to make a choice between going out and digging or staying home and analyzing their finds and publishing their findings. During the latter part of the twentieth century they leaned toward digging. The fact that the Arctic has been populated by a number of different cultures with different technologies implies that whatever boat technology existed may also have changed drastically from one culture to the next. Unlike humans who in their DNA carry a record of their ancestry, nothing of the kind exists for kayaks and other inanimate objects. What you see is what you get and you can only guess where the idea to make a thing a certain way first came from. For kayaks, this sort of speculation is especially difficult because kayaks decay rapidly and little or nothing remains behind after a few thousand years. 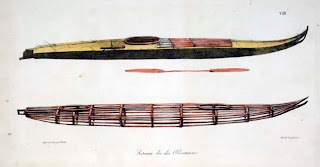 So when we look at a Bering Sea kayak and an Aleut baidarka, we can see some sort of design similarities and obvious mutual influences, but without some physical record, we have no way of knowing who came first and who influenced whom. 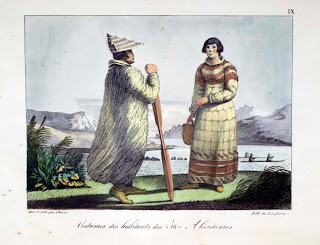 Perhaps in the future, more digging and analysis will establish a sequence of cultures for the Arctic and the Aleutians and that sequence in time as well as in location will give us some clue how people and technologies moved around the region. Recently, stone tools were found on the Island of Crete in the Mediterranean. The tools were dated at 130,000 BP. Crete has been an island that whole time. The only way that the tool makers could have gotten to the island was by boat. Boat building is obviously a very ancient human activity. There is nothing in principle that would have prevented the invention of the kayak in the Arctic from t he time that people first moved there. The question is only whether they did. I don't know how much I already revealed about the baidarkalounger project, but here's a recap and update on recent developments. Recap: The concept was simple - build a baidarka that is wide enough to be stable but not so wide that you can't paddle it. The baidarka should also be large enough so you can move around in it without capsizing and the cockpit should be large enough so you can lay down in the boat if you want to. In other words, I was going to build something on the order of a partially decked over canoe. This basic concept was then expanded to add features to the boat to make it sailable, namely, rudder, mast steps and lee boards. Update: Here's the story in pictures. long enough for just about anybody to lay down in the boat. Here's the completed frame. As you can see, plenty big and the back of the cockpit is high enough to lounge against. The boat with the skin on. Total length, 18 feet of which 6 feet is cockpit. The boat set up with a sailing rig courtesy of Time Anderson. The sail was cut down from a wind surfing sail. The boat floating empty. Note both the bow and stern clearing the water. The boat with a paddler. Note that the stern no longer is out of the water. Correct trim with a single paddler is with the paddler forward of the back of the cockpit. With the paddler sitting all the way to the back of the cockpit, the bow comes up some. That's Joe Karr doing the test drive. And here's the boat running before the wind. Both lee boards are up to reduce drag. The sail is reefed. I'm still not real bold with the sailing, given that the water is cold right now and I wasn't wearing a dry suit. Maybe next time, dry suit and full sail. Closeup on one of the lee boards. For now, the apparatus is held to the gunwales with C-clamps. Once I figure where the ideal location is for the lee boards, I will rig up something more elegant. 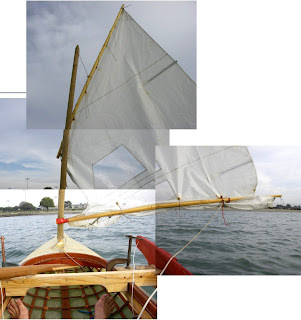 As this sail test revealed, I also need a bigger rudder. And here it is, sailing done, lee boards strapped to the roof. I suppose they'll help the car track better in a beam wind. Conclusion so far: The sailing rig needs more testing. I am already thinking of making a 15 foot long version of this design. At 18 foot it's a lot of work to push along with a paddle. It will go 4mph. With two people, it will go 6mph, but both paddlers have to paddle in synch or the paddles will clash. Great boat though for taking out a few kids or the family dog or a few hundred pounds of camping gear. Mike Livingston, Unangan (Aleut) boat builder has been working on bringing more recognition to traditional Aleut kayak builders, especially Sergie Sovoroff who was one of Mike's teachers. Sergei made models of baidarkas, complete with paddlers and all the accessories that went on the baidarkas. When I went to the Alaska State Museum in Anchorage with Mike last July, he showed me one of Sergie's models on display, and sure enough, the label that came with the model made no mention of Sergei. In defense of the museum, we might point out the the people who donated the model to the museum may not have known who made the model and so the curators at the museum put what they knew on the label, namely the name of the donor. But things are changing. Native artists are signing their works and are being represented by galleries and are starting to get paid reasonably for their work. But if you're not an artist and just a person who makes stuff you still don't get to sign your work. The corporation puts their logo on it, but that's it. The only commercial product that I've seen with the name of the person on it who made the thing is cardboard boxes. Moral of the story: if you want to be recognized for your work, put your name on it.